I’m talking about healthcare venture capital – the seemingly ugly step-child of venture capital these days. But beneath that tussled appearance is a beautiful object to behold and worship. The cold, hard facts that the haters love to deny show that healthcare venture investing has outperformed every single other category of venture investing since 2000. Looking just at the thousands of realized venture returns in the past decade, it’s easy to see that Healthcare puts IT/Internet, Software, Hardware, Consumer all to shame. Here is the data is from the largest database of venture returns out there. No matter how you look at the data, healthcare outperforms. It’s true by stage at initial investment (healthcare wins at every stage from seed to expansion for the past 10 years). And it’s true for % of realized exits greater than 3x and 5x in the past 10 years. Healthcare again – FTW. 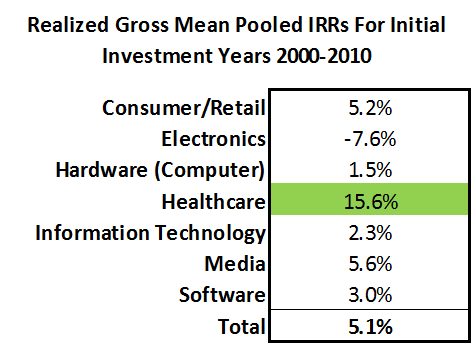 % of exits below 1x invested capital – healthcare has the best #s there as well. By far. You wouldn’t know any of this these days – where the talk in the Valley reminds me of exactly where things were 10 or 12 years ago. Just as it was back then, I’ve heard many IT investors and VC industry watchers write off healthcare venture as being done and over. Wrong. First – There are 40M Americans age 65 or older today. That numberwill grow to 80M in the next 30 years. By any measure, that is a huge new market to be served by healthcare services, drugs, and medical technologies. Second – The fastest growing segment of the US population over the last 10 years and projected to be the fastest growing over the next 30 years is people over the age of 100. That 100+ group has grown 40% in the last decade and is expected to grow by 650% over the next 30 years. The sectors with the best cash flows, best gross and net margins in the world are public pharmaceuticals, large cap biotech, and medical devices. And those are the companies who have the most to lose as patents expire and internal R&D dries up. No, I’m not a sucker or a promoter. I’m just calling’em as I see’em. Yes the FDA is tougher now than ever, and yes the costs of drug and device development are daunting. But the pendulum will swing on those items as it always does. And we will be left with a society where an ever-increasing percentage of our GDP is spent on healthcare and an ever-increasing percentage of our population work at health industry jobs. I am of the firm belief that the next few decades will be all about novel and innovative health services and technologies that will transform how we age and manage our way through the dizzying healthcare system. So, I’m officially calling out to my fellow comrades in healthcare VC: Be strong. Stand up. Be proud.